The divine Maximus, who was from Constantinople, sprang from an illustrious family. He was a lover of wisdom and an eminent theologian. At first, he was the chief private secretary of the Emperor Heraclius and his grandson Constans. When the Monothelite heresy became predominant in the royal court, out of hatred for this error the Saint departed for the Monastery at Chrysopolis (Scutari), of which he later became the abbot. When Constans tried to constrain him either to accept the Monothelite teaching, or to stop speaking and writing against it - neither of which the Saint accepted to do - his tongue was uprooted and his right hand was cut off, and he was sent into exile where he reposed in 662. At the time only he and his few disciples were Orthodox in the East (See also August 13). 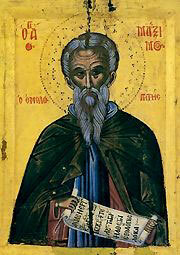 Share the feast of Maximus the Confessor with an icon greeting ecard.